Imagine the productivity. 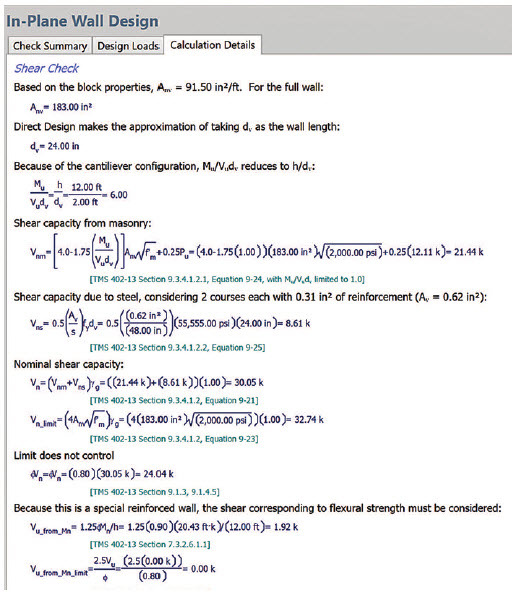 Model a masonry building, enter a few basic parameters from ASCE 7, then wait for mere seconds while a complete set of structural calculations and drawings are created. Try a different block size and repeat. Multiple stories, rigid diaphragms, high wind speeds and more: All now handled with the latest version of Direct Design. Then in the not-too-distant future, the ultimate in convenience with the ability to import building geometry from an architect’s Revit model. The new Direct Design Software 3.0 release delivers wider scope, transparent calculations and rapid design. By any measure, this significant step forward will improve the lives of engineers and contractors alike. The Direct Design initiative began in 2010 when The Masonry Society released the first edition of The Direct Design Handbook for Masonry Structures (TMS 403), a streamlined approach to code-compliant masonry designs for relatively simple structures. An engineer could determine a few basic parameters, then use handbook tables to look up required reinforcing patterns and other design details. A couple years later, software was introduced to automate this. Easy became easier. Not only were the table lookups now automated, but fully-detailed drawings documented the design. Everything a user could want, right? Almost. The trade-off for such speed and ease was a narrowing of scope. In order to facilitate the tabulated approach in the handbook, the structure was limited to use only 8" block, #5 rebar, single-story, flexible diaphragms and other constraining factors. Additionally, conservative simplifications were made, and for some scenarios, these would compound and result in an overly-conservative design. The handbook and software were well-received as a concept, but fell short of being practical for everyday use. Users wanted more. Heeding this call for improvement, the task force behind TMS 403 went back to work. The Direct Design concept was re-thought from the ground up. The table approach, though innovative, was restrictive when trying to expand capabilities. That the method’s primary usage was via software made the efficiency of a tabulated system largely redundant. Software can crank through calculations directly, rather than look up pre-calculated values from tables. For this reason, TMS 403 was re-tooled to be more of a guide for applying streamlined masonry design rather than a specific table-based implementation. New code provisions were drafted and new algorithms developed. The result was a substantially slimmed-down standard. Removal of tables trimmed much of the book’s content along with limitations. What remains is a guide for those wanting to understand how to cut through the clutter of heavyweight design codes and quickly get to the subset of provisions needed for common structures, as well as a number of shortcuts and conventions to make design more practical while preserving flexibility. The latest edition of the Direct Design Handbook for Masonry Structures (TMS 403-17) is available from The Masonry Society’s website, MasonrySociety.org. The new edition of the handbook will be accompanied by a new release of the associated software package: Direct Design Software (DDS), which will be available at DirectDesignSoftware.com. This time, the objectives are to harness the improved ability of the standard and to make it more practitioner-friendly by displaying internal calculations and reasoning that the software goes through. This provides users a tool they can have full confidence in, on top of the speed and simplicity benefits. The most striking attribute users notice when first running the program is the way it displays actual calculations behind the design, rather than narrating a series of table lookups. This is reflective of the inner workings of the software and the method itself. The design is live rather than retrieving numbers from pre-calculated tables. By providing calculations, DDS can be used as a training tool for new engineers to check their hand calculations. Figures 1 and 2. Equations and logic from ASCE 7, TMS 402 and TMS 403 are shown along with fully-illustrated drawings to provide context. These address one unavoidable liability of the old table-based approach: the lack of transparency and limited ability to verify calculations that were hidden in the tables. Additionally, this approach removed the need for many restrictions and over-conservative shortcuts necessary to accommodate the tabulated format. The methodology of TMS 403-17 is wide-open and the software has dropped many limitations. All of these items are fully exposed to view to provide opportunity for the user to scrutinize the calculations and become comfortable with the results. All this without sacrificing the fast, direct aspect of the design. More complex models are now allowed. 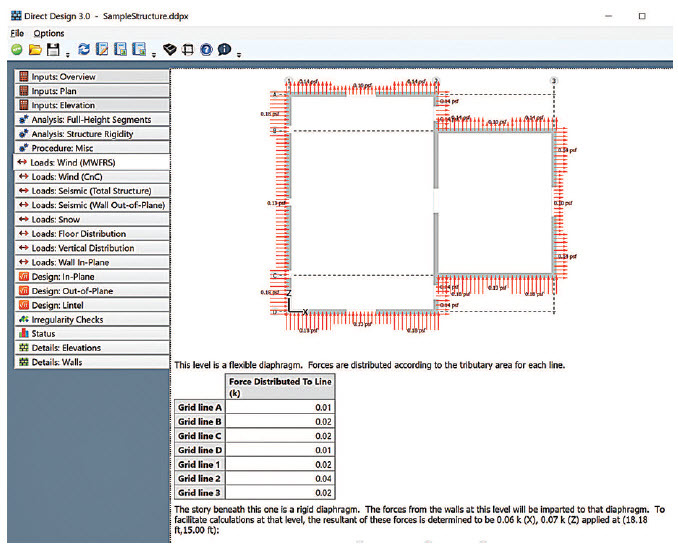 DDS provides a quick way to produce a code-compliant, fully-documented masonrybuilding design. Some limitations remain. Neither the software nor the Direct Design concept itself is intended to handle every exotic geometry that an architect might conceive of. Among others, the structure plan layout cannot include curved or diagonal walls and must meet certain other restrictions for the simplified analysis to work. The structure can’t exceed 60' in height. Certain of the irregularities defined in ASCE 7 (large reentrant corners, for example) can cause problems and may need to be avoided. DDS also does not design the diaphragms; it only distributes the loads. 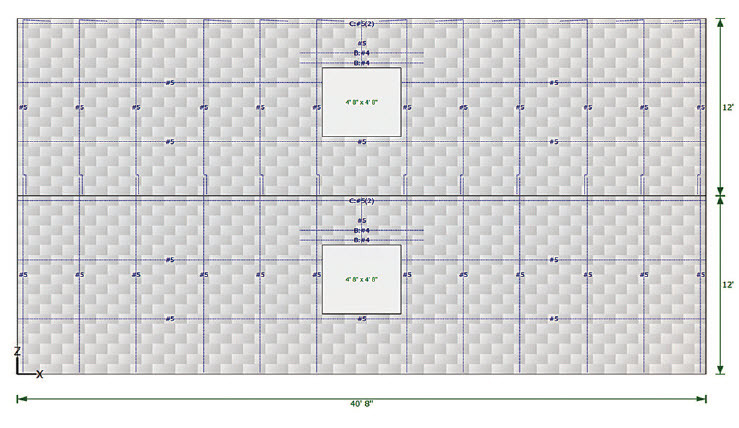 When the design is finished, the program will produce drawings of the designed walls. Figure 3. By itself, Direct Design Software is a remarkable tool for automating the engineering of masonry. Recognizing the benefit of interoperability between programs, the masonry industry’s BIM-M initiative (BIMforMasonry.org) has launched a project to add the ability for the software to import and export digital model information. DDS looks beyond the scope of the structural engineer’s work and considers integration with the larger AEC workflow. Consider the typical scenario near the beginning of a project. The architect has a model of the structure created. Ideally, one could simply import this model into the engineer’s design software, saving time and reducing error in the process. Similarly, when DDS has completed its design, it would be provided in digital form to those using it downstream. For example, knowing rebar positions is important for mechanical, electrical and other disciplines as they wrestle with where to create wall penetrations through which to run their systems. Direct Design Software will be working to make this vision a reality. Import Entering building geometry (walls/openings/stories) is generally the most time-consuming portion of the input process. If the information already exists in a Revit model, this can be reduced to a few mouse clicks. Note that a Revit model can contain a structure with any sort of atypical geometry, including things that DDS does not allow (such as diagonal or curved walls) so portions of some models will be filtered. The software will explain why some walls may not have survived the import. Export DDS will also send information back to Revit. For this initial effort, the vision is to export drawing information in the form of schedules or sheets, or possibly both. More extensive detailing information will likely be added in the future. Collectively, these new enhancements to Direct Design Software give the masonry industry much to be excited about. Version 3.0 is slated for release by the end of 2018, with the Revit interaction portion planned for the months following. Russ Peterson,MSCE, president Ensoltech, in Bozeman MT, is an engineer, software developer and active member of The Masonry Society (TMS). He has been developing structural software for over 20 years, including Direct Design Software and other masonry design software. He has participated in the development of the last several editions of The Masonry Designer’s Guide as well as various other TMS design guides and publications. Ensoltech has been working with the BIM-M initiative on the advancement of masonry modeling technology. 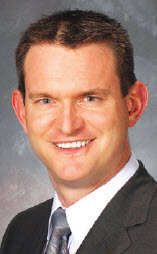 Peterson holds MS and BS degrees in Civil Engineering from Montana State University.